The woman stands with arms raised and fingers out in a gesture of welcome to a room full of dinner guests. The setting is a warm and hospitable home with the guests all in fancy dress. The table is set with a silver candelabra, a sumptuous fruit centerpiece, and fresh cold beer in glasses on a silver platter! 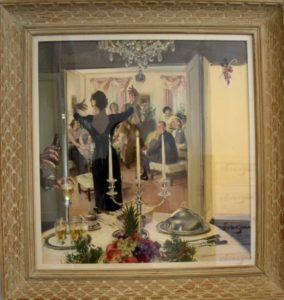 What I love about this painting, which hangs in my office, is the message that beer belongs, even at the fanciest feast. The painting, one of a series commissioned by the U.S. Brewers Association between the mid-1940s and the mid-1950s, as part of a “Beer Belongs” advertising campaign to promote beer as “America’s Beverage of Moderation.” The ads were revolutionary for their time, because they promoted beer in a variety of fun and friendly settings, none of which was a stereotypical bar. April 7 is National Beer Day, which celebrates the Cullen-Harrison Act, which President Franklin Roosevelt signed 85 years ago to end Prohibition early for beer. On National Beer Day, we celebrate the many ways that beer belongs in our history, culture, and society. This year, we’re also commemorating the “Beer Belongs” campaign, which was one of the most successful industry advertising campaigns of the 20th Century. Now in the 21st Century, beer remains America’s favorite beverage alcohol product. Most beer is low in alcohol and comes in standard serving sizes, making it easier to moderate your consumption. The number and variety of beers available is greater than it’s ever been. I’m fond of saying that there’s a beer for every occasion and an occasion for every beer. Beer goes with everything. On this National Beer Day, raise a glass to celebrate that in this friendly, freedom-loving land of ours — beer belongs … enjoy it!